Welcome to the first edition of the Hillsborough Street Renewal, a monthly e-newsletter keeping businesses and residents along the corridor up to date on construction news. Richard joined the City in January 2015 as a Project Engineer II and shortly after that took over the management of the Hillsborough Street Renewal Project. Richard is alumni of North Carolina State University and an avid Wolf Pack fan. He also is known to be a regular at a few well known Hillsborough Street establishments, which I am sure, will see even more of him now that construction has started. 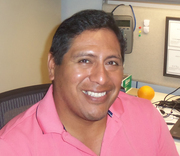 L. Fernando Rios is an Industrial Engineer originally from Peru. 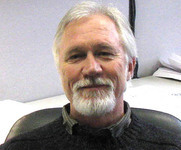 He joined the City of Raleigh Right-of-Way Inspections group in August of 2007 where he inspected infrastructure construction on private development projects. In September of 2013, he joined the Design & Construction Division and became a Senior Engineering Inspector dedicated to Capital Improvement Projects. You will see Fernando out on the project just about every day. Pipeline Utilities, Inc. is a licensed general contractor located in Raleigh, North Carolina specializing in infrastructure and heavy civil projects. Established in 1981 with one utility crew the company has grown to over 75 employees consisting of 12 utility crews and support staff. Pipeline Utilities has served as both the prime contractor and subcontractor on projects throughout the state. 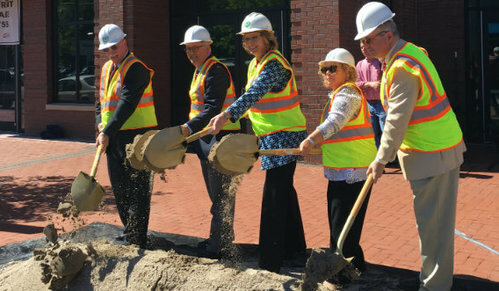 On June 9, 2016, the City hosted a groundbreaking ceremony. Mayor Nancy McFarlane was the featured speaker during the ceremony. Council Member Kay Crowder, North Carolina State University Chancellor Randy Woodson, Hillsborough Street CSC Executive Director Jeff Murison and David Moser, owner of Pipeline Utilities Inc., the general contractor for the project joined the Mayor at the podium. To read more about the groundbreaking visit our Hillsborough Street website. On June 21, 2016, contractors began working along the corridor. The first order of business was to set up traffic control devices along the south side of Hillsborough Street, allowing for two ten foot lanes along the corridor. Due to congestion issues during the day this work had to be completed during night hours. 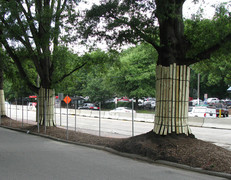 After the traffic control devices were set contractors installed extensive tree protection devices on the south side of the street. This included installing a chain-link fence and wrapping trees in wood to protect them during construction. Contractors brought in heavy equipment in the following week, and crews started the underground infrastructure work in areas along the corridor. 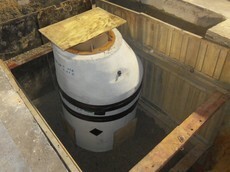 Crews installed a new sewer manhole near Dixie Trail and installed two new precast electrical vaults at the private drive across from Bagwell Avenue. With the completion of the sewer manhole near Dixie Trail contractors started to install the sanitary sewer line from the manhole towards Bagwell Avenue. Crews will be completing this portion of the work during the nighttime hours due the proximity of the site to traffic along the corridor. There are lane closures associated with this part of the work, and flaggers will be directing traffic. If you are traveling through the corridor during this time, please use extreme caution. During the daylight hours, work is also progressing along the street. On the south side, crews are installing the electrical and cable conduit from the private drive across from Bagwell Avenue east towards Dan Allen Drive, and installing sanitary sewer lines from Gardner Street towards Brooks Avenue. Visit the web site for weekly updates. Students are returning to college in the next few weeks. With the large influx of both pedestrian and vehicular traffic, it is important that we reiterate the importance of safety throughout the work zone. Your safety and the safety of construction crews are of the greatest importance. 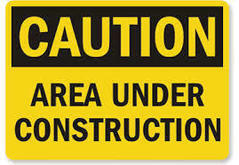 For this reason, please pay close attention to construction signage while traveling through the construction zone. There are pedestrian detours throughout the work area, and it is important to follow all detours and to cross Hillsborough Street at marked crosswalks. Pedestrians should not walk along or through the construction barriers. These areas can be dangerous so please follow the marked detour routes. There is heavy vehicular traffic congestion during construction, and there are new traffic patterns in place. When driving along the corridor pay close attention to construction signage, drive slowly, keep a lookout for pedestrians and cyclists, and maintain a safe distance from the vehicle in front of you. At night pay close attention through the work zone, as there is night work associated with this project. They will be lane closures and flaggers at different locations along the corridor, so please stay alert and drive slowly at all times. There are multiple ways to stay up to date on the project. 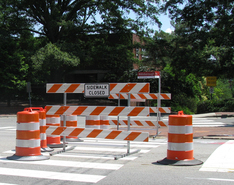 We have the Hillsborough Street Renewal Project website, which is updated weekly. The City of Raleigh launched the Hillsborough Street Renewal Project website on June 1, 2016. The website has project information including construction schedules, traffic updates, and even business highlights. The site is updated at least once a week with the latest in project news and updates, and even a weekly project construction schedule, so make sure to check back on a regular basis for the latest news. The City has a Hillsborough Street Renewal Facebook page that we regularly update with project information and construction pictures as well as other fun stuff. 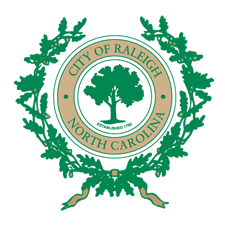 Design and Construction also has a Twitter account @RaleighESDC which posts information about City of Raleigh roadway and sidewalk projects including the Hillsborough Street Project. Lastly, the monthly e-newsletter, which will be published the third Monday each month. You can sign up to receive the e-newsletter on the Hillsborough Street Renewal Website. Until next month, stay safe in the work zone!